Happy children playing outdoors in the warm summer sun. What could be more innocent and healthful? Lots of things, it turns out. While fresh air and most outdoor activities are undoubtedly healthy and wholesome, exposure to sunlight can be deadly. Researchers have determined that moderate to severe sunburns experienced in childhood can actually be the cause of skin cancer that arises long after adulthood. In a recent issue of Time Magazine, Ian K. Smith , M.D. writes "Each year 1.3 million Americans fall victim to skin cancer, and 9,000 of them die. Sadly, almost all these deaths could have been prevented. The problem is that not enough of us are following basic sun-exposure precautions, especially our children." Many parents aren’t aware of the special sensitivity of youthful skin. In the course of a typical lifetime, 80 percent of the sun’s damage to the skin occurs during childhood and adolescence. That makes it all the more important to keep youngsters from getting sunburned during these critical years." Designed for Fun has teamed up with Apollo Sunguard Systems, Inc. to do our best to overcome this human frailty. Apollo Sunguard Systems has made a business of sheltering people from ultraviolet radiation, and, almost as a fringe benefit, making them more comfortable in the bargain. 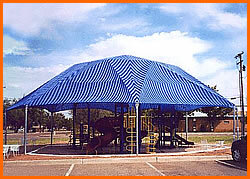 In addition to offering up to 94 percent protection from harmful UV rays, Apollo Sunguard’s shade canopies can cool the areas beneath them by as much as 15 degrees F .
Our shade structures are available in a myriad of shapes, sizes, and colors. 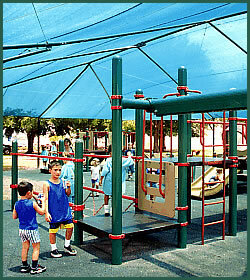 They are manufactured with the best quality steel and shade fabric available today. A Designed for Fun representative can assist you in evaluating your needs and guide you through the design and selection process. 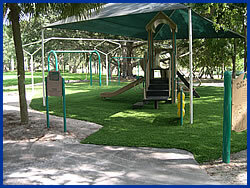 Check out the Apollo Sunguard System website at www.sunguard.net for more detailed information on the complete array of available shade products.